Although we use the most standart fonts,sometimes we may need some different fonts for our designs.Gothic fonts are one of them. 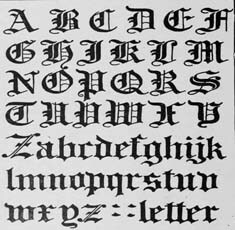 If you design something gothic or even old fashioned you can prefer a gothic font. Today we bring together a collection of most used gothic fonts used by designers.All the fonts are free for personal use but please check carefully if it is free for commercial use.